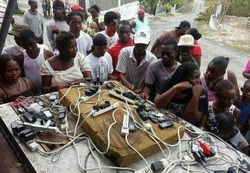 This is a picture of Ghanaians waiting to charge their cell phone because of lack of electricity. This is very sad after Cerebrating 56 years of Independence year anniversary the ECG can not provide constant and continues supply of electricity in Ghana. Majority of Ghanaians rely on personal electric generators. Most people in Ghana use their cell or mobile phone for internet connection. Internet connection is vey important but many people complain that internet connection in Ghana is very slow. It is very difficult to connect Skype. This problem can be fix but we need to find the problem. Do you experience slow internet connection? If your answer is yes then let know your experience and make some suggestion as how to fix the problem. Please write your comment.